Strapaholics! | Information Site for Watch Strap Collectors! News, Reviews and Forums! 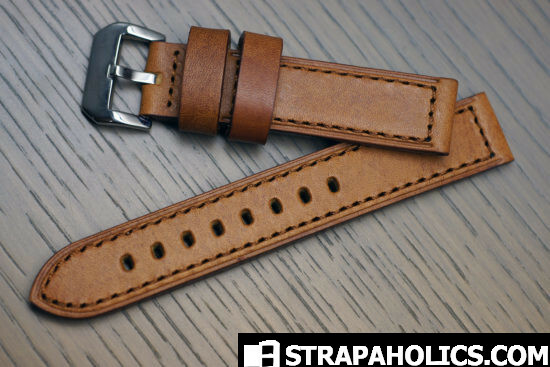 Strapaholics is the premier community for Watch Strap enthuisiats discuss and review watch straps. 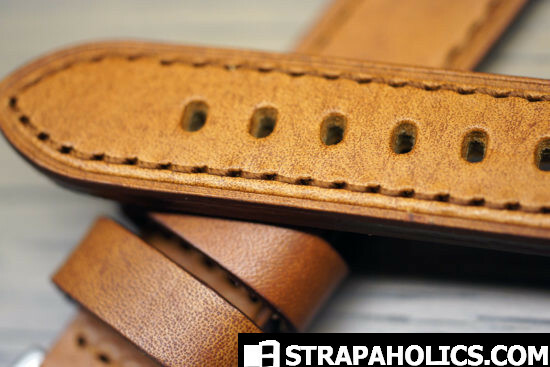 Strapsco is a US and Canada-based strap seller that produces a wide-range of straps for all sorts of different types of watches. 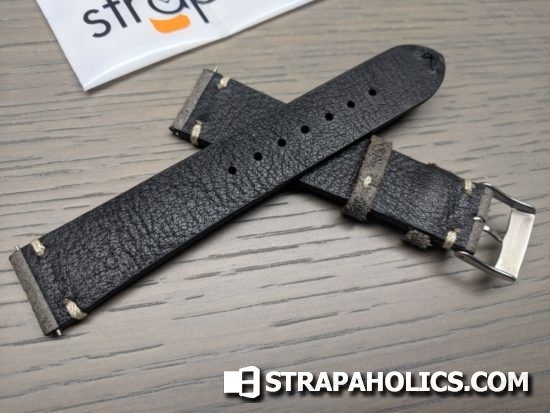 I reviewed another strap from Strapsco a little while back, it was a Bell & Ross strap. 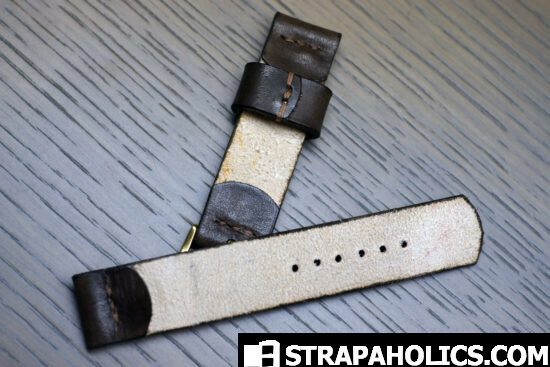 Today I’m taking a look at a couple of their general straps that are good for replacement on a range of different watches. The two straps I’m reviewing today are a Patina Distressed Italian Leather strap in Grey and the Belize Nubuck Suede in Tan. Both are well-made straps with professional finish for very affordable pricing. As of this writing they are both on sale but that might not last long – at the sale price they are a no-brainer for sure. 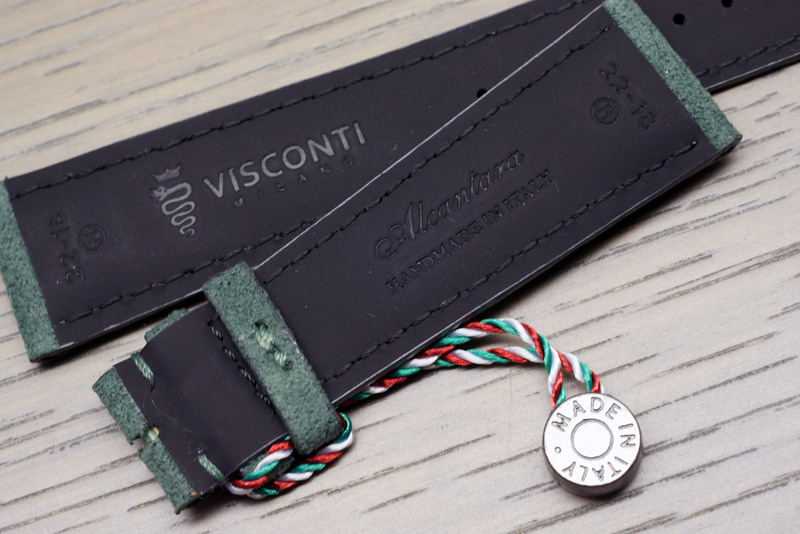 These straps are made with fine Italian leather on swiss machinery in China. Let’s take a look at this Grey distressed strap first. Great little distressed piece with vintage-inspired stitching. The different colored stitching at the tip of the long tail is an interesting touch. The straps also all come with buckles and spring bars which is a nice little bonus. The straps construction feels like a very solid piece of leather, which makes it feel robust. I quite like the feeling of the strap overall. 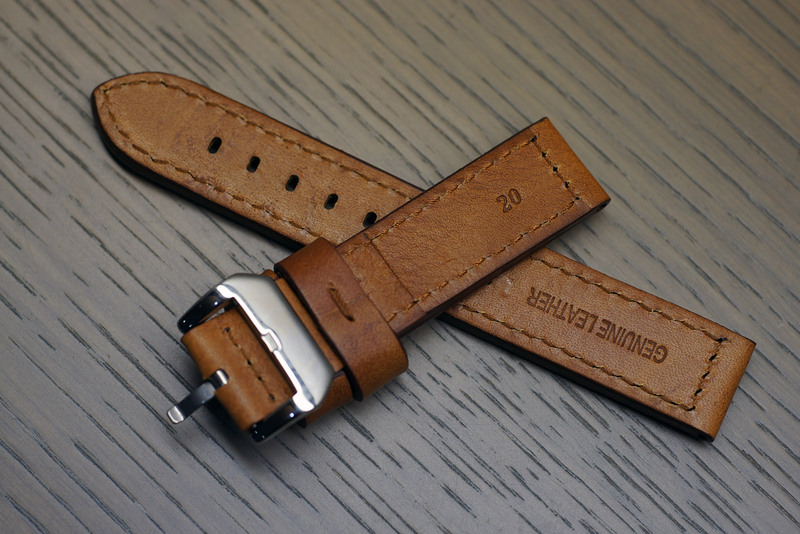 I also really like the distressed finish on the strap, it looks great. While it may not be for everyone, I do like these types of straps. The back of the strap is lined with a soft black leather that feels great on the skin. Finishing is really good on this strap, and I’m actually quite impressed with it. 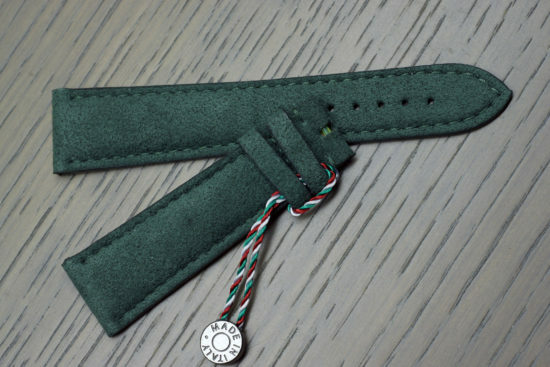 The style of this strap would really suit a Panerai actually! The smell of the leather is also very nice which is an important feature for me – probably because it is Italian tanned leather. Let’s take a look at the next strap. The second strap I’m looking at today is their Tan Nubuck Suede. 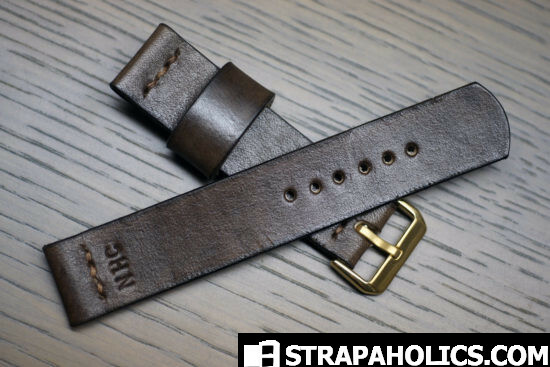 Its a similar construction to the Distressed strap above, but has a cleaner look to it with finer machine-stitched thread. 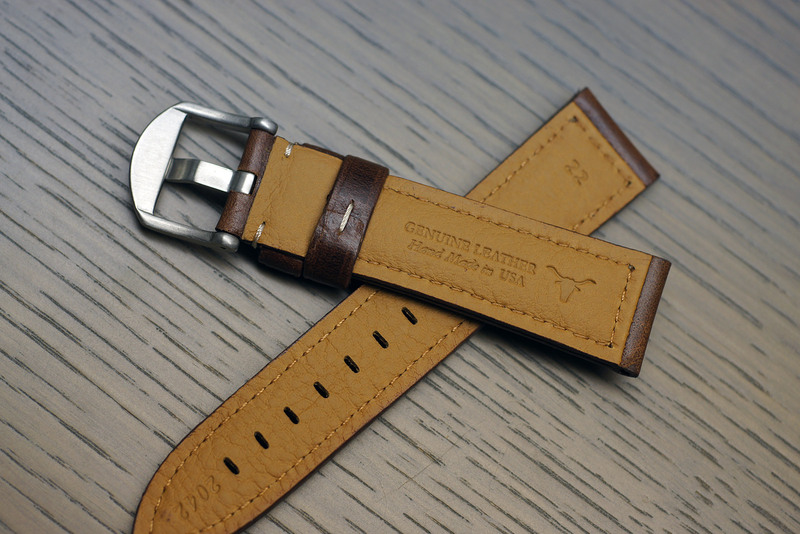 This is a very flexible and comfortable strap, with an extremely fine and soft nubuck finish on the surface of the strap. 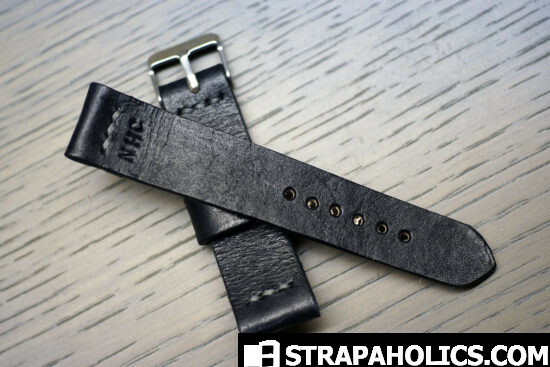 The back of the strap features the same black leather backing that the distressed strap features. Double keepers with one fixed and one floating keeper is always good feature in my books. Again, a nice smelling strap, unlike a lot of other straps that are made in China. This is a solid piece. Overall these are two great straps that offer exceptional value to anyone looking to replace their existing straps or just add more straps to their collection to give their watch a little bit of a different personality every once in a while. kyRos returns with a second review of his outstanding Vintage recreations. The Vathy is a superb orangey-tan-brown strap built with historical techniques and stays true to the vintage Panerai strap DNA – thus the name of the strap line: DNA. 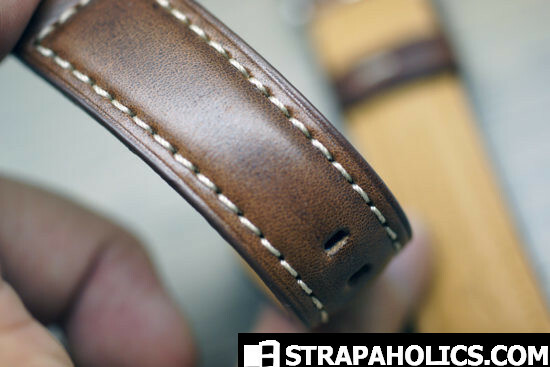 Hope you enjoy this review of a superb strap from our Grecian brother, kyRos. 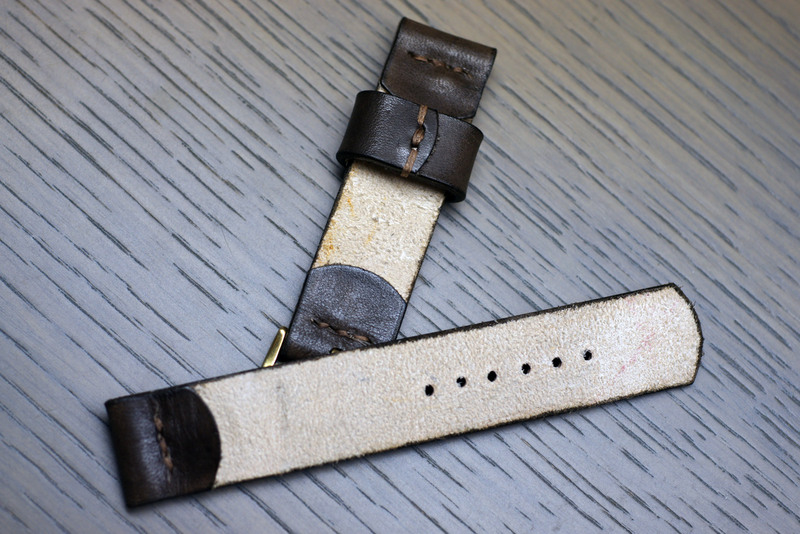 Lac Crado from Singapore has been crafting Panerai straps from exotic hides for some time. 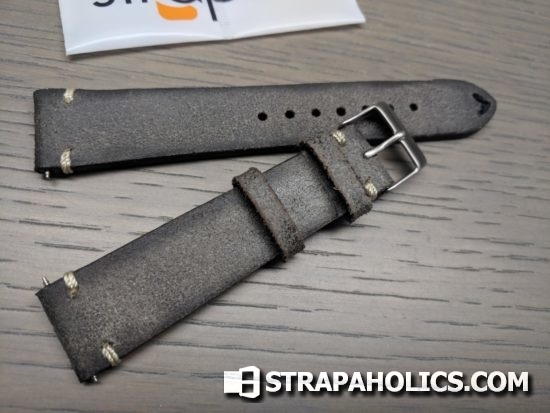 The first strap I reviewed of theirs was a shiny silver piece, but this one is much more of an everyday strap, and is even an OEM replacement for Tang Buckle straps, and comes in at a very attractive price point. Check out this very nice Crocodile strap from Lac Crado. 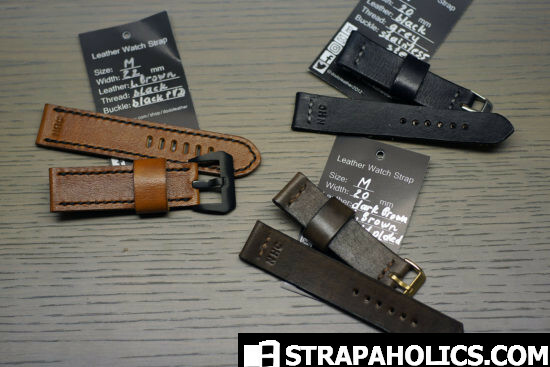 Posted a review of Strap Geeks watch straps from the Netherlands! 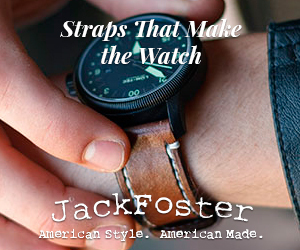 Fantastic value straps from a top notch new maker. This is the second review from Strap Geek I have done, and he has much improved his technique and now is a great choice for your Strap needs. 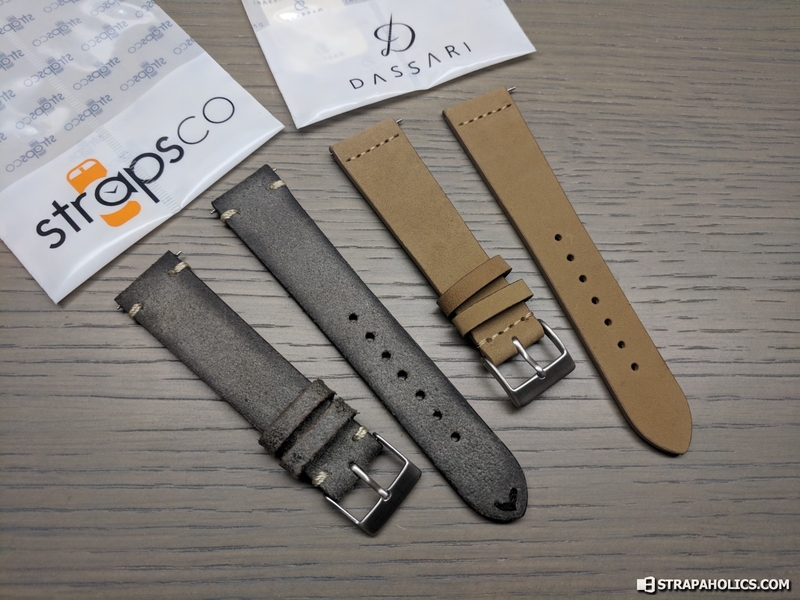 Brand new review on Paneraisource for Kastantona Straps of Cyprus. 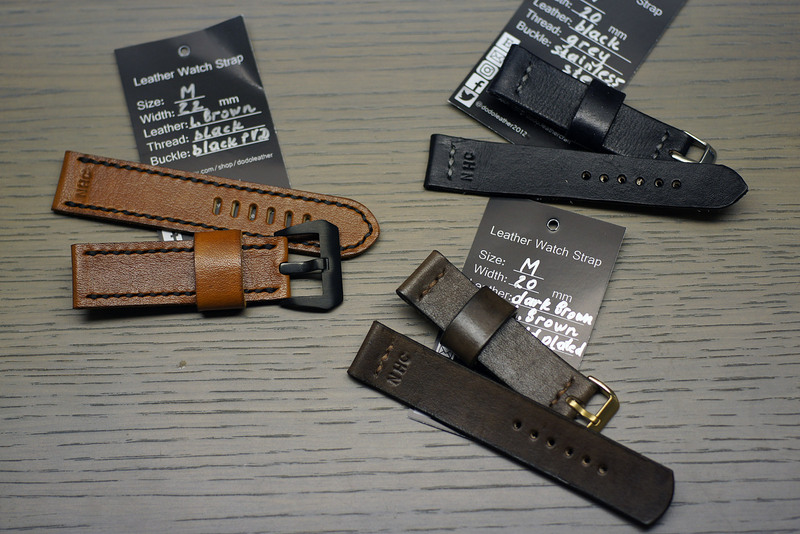 These are some very nice straps for a good price, customizable as well. I think that Kastantona has some great ideas brewing and their stuff is just different enough to warrant a look for those of you that are seasoned strap buyers. Got a couple of straps in from my friends at Total Watch Repair in Los Angeles. These are some very well-made straps out there for the money. I’m usually reviewing the hand-made stuff and what not, but the big production strap houses make good stuff too and often at a better value. Companies like Hadley Roma and Hirsch actually probably offer more value at the low end than most boutique watch strap makers. 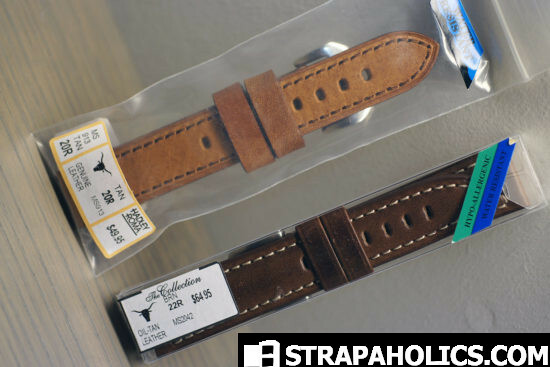 These two straps are prime examples of affordable straps that are of superb quality. Packaging is uneventful, but at this price point I wouldn’t want to see any “added value” wasted on packaging. We’re looking for no-nonsense straps at this price right boys? 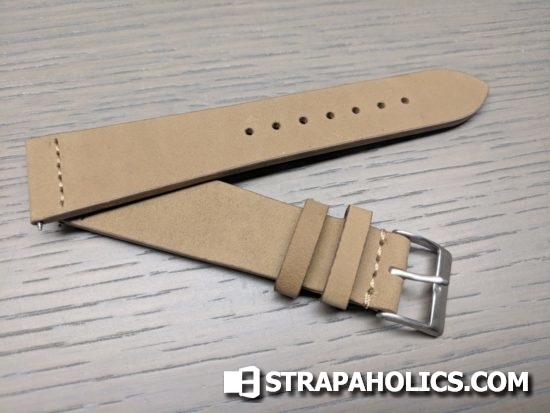 First lets take a look at the Hadley Roma strap. 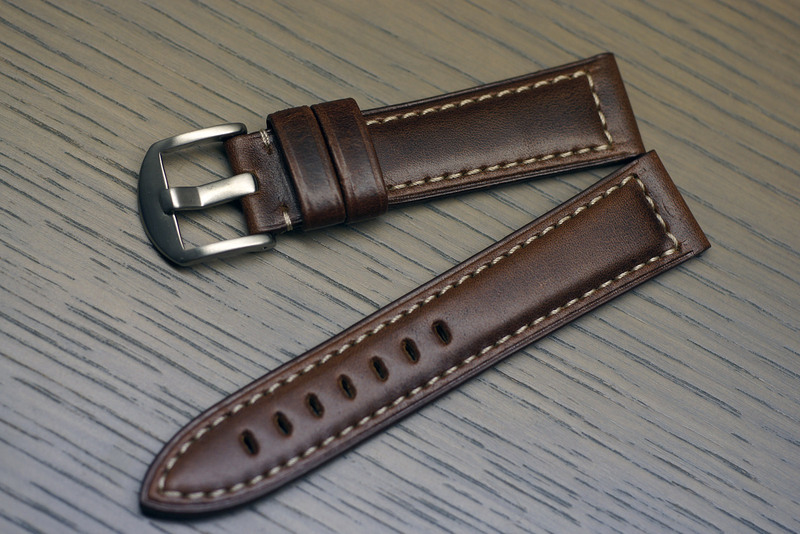 Its a nice tan color, flat and unpadded with a Panerai-esque style to it. At 20mm, this wouldn’t be for a Panerai, but would definitely let you get some of that Panerai style on your Seiko or similar diving watch. Leather is of a good quality, and the strap is made in China though the overall quality is very good. Nice texture on the leather there, giving it some character. 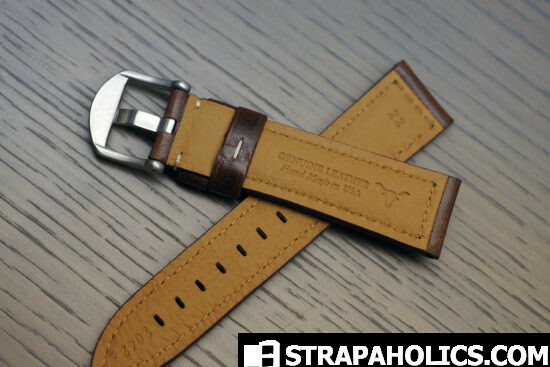 The stitching is very straight and nicely done and overall the production of the strap is top notch. No complaints, especially with the $50 price tag. The strap is fairly stiff, and will take some time to break in. A shot of the back, it is a foldover style construction, with a sandwich layer in-between. Two keepers, one fixed and one floating. The buckle is a polished chrome, with a mini-Panerai bent buckle style. Overall a superb bang for buck at $50, especially when compared with most of the handmade stuff at $50 out there. This is a fully finished, complete strap.. all the edges are finished, the back of the strap is foldover instead of raw. 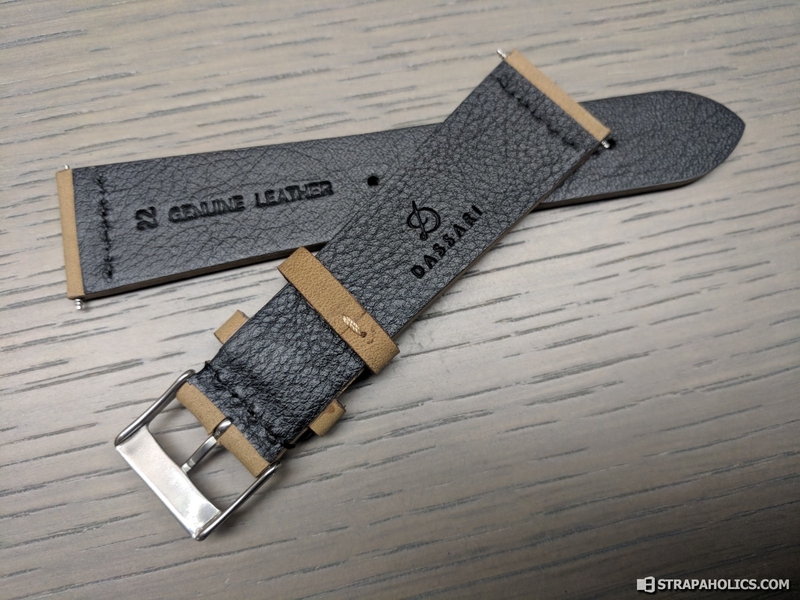 More and more I see handmade straps offered at lower price points but they don’t line the back of the straps, or they don’t provide two keepers among other things to cut costs. Lets look at the next strap. This strap is from “The Collection”, which I am not too familiar with. 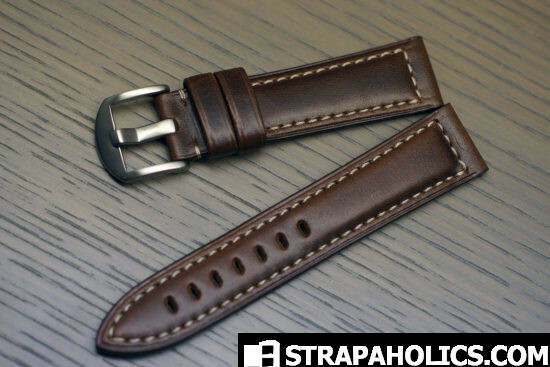 Its a really nice strap though, and even nicer than the Hadley Roma for a few bucks more at $65. 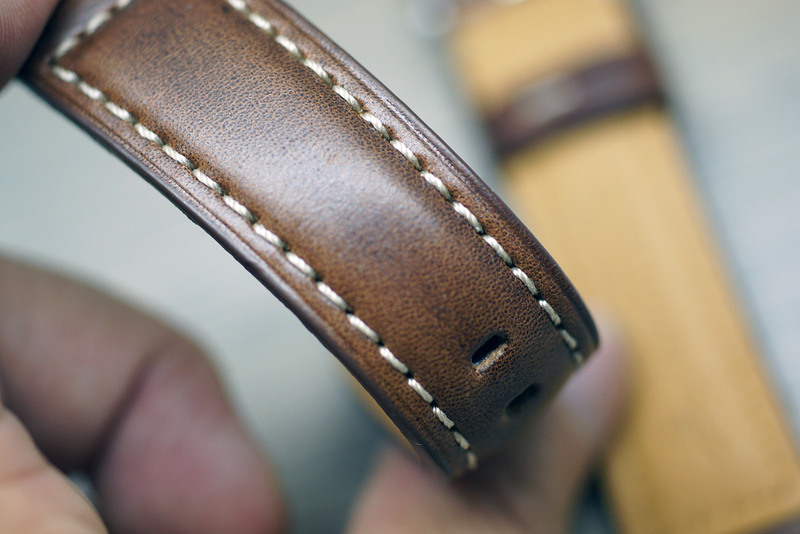 This is a nice oil-tannded pull-up leather, which gives a nice color when you bend it as seen in the photo below. 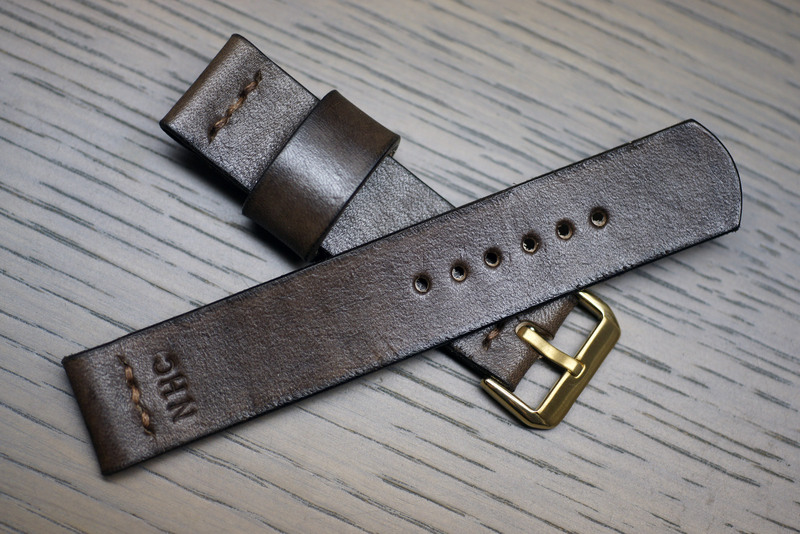 Sort of a Chocolate brown in color, it has contrasting white stitching which sets off the brown nicely. 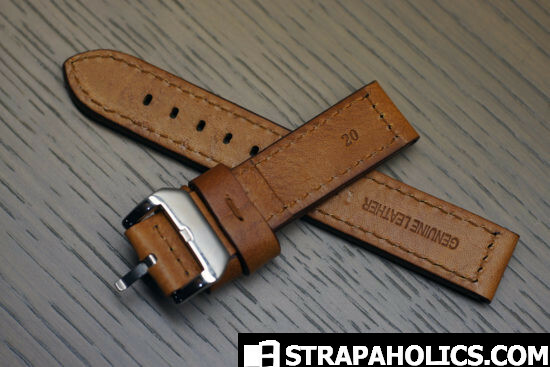 This is more along the lines of a Breitling style strap and is even made in the USA. Stitching is perfect, and certainly presents as a solid value OEM replacement for Breitling straps or other similar brands. 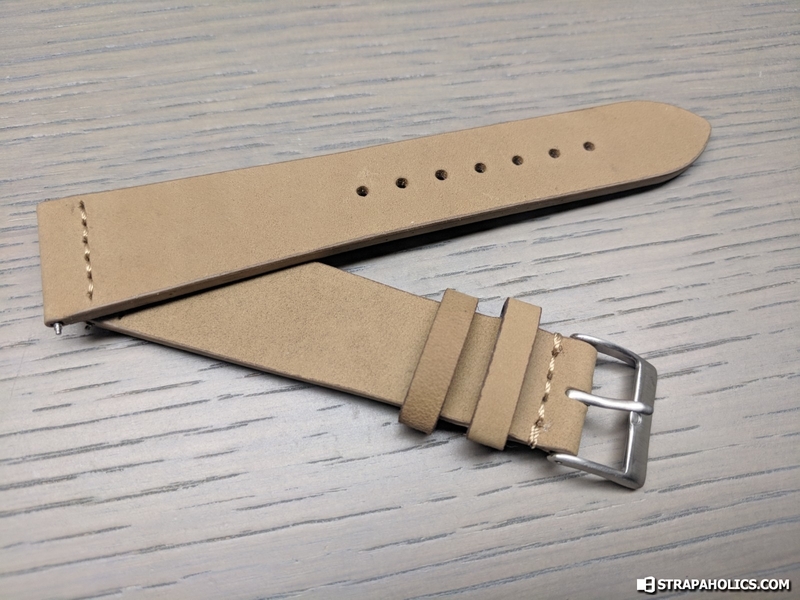 This strap is much more flexible than the Hadley Roma, and features a more common production construction style with the soft leather liner on the back side. This usually results in a more comfortable strap, though less durable and rustic than a foldover style construction – though realistically you probably aren’t going to break either of them! Its plenty robust just the way it is. Overall a nicely made pieces and both present a solid value to buyers. 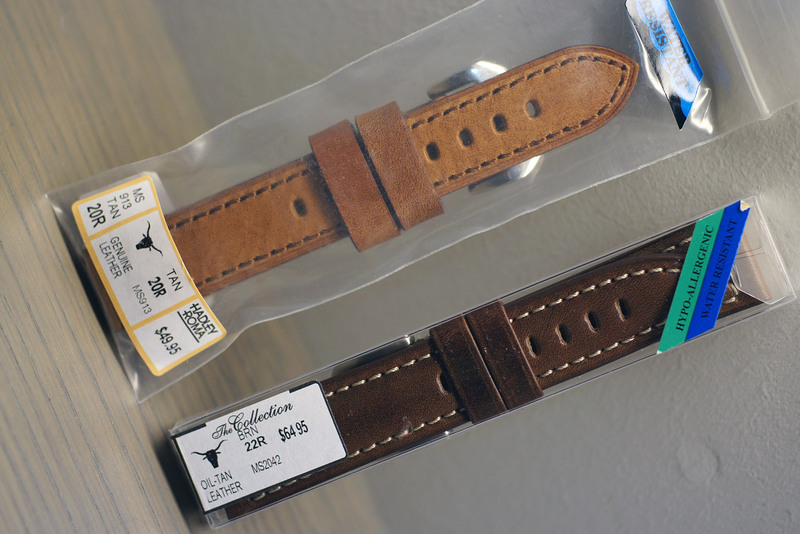 Thanks again to Total Watch Repair for providing us with these great straps! A newer Singapore-based strapmaker that specializes in exotic hides and materials. See the full review on Paneraisource here. Focus is on Panerai-style straps, but they can make just about anything that you want. This silver double hornback crocodile is indicative of the style of straps that they’re producing. I just received a brand new strap from this company based out of Milan, Italy called Visconti Milano. They specialize in bespoke straps but also have a large selection of ready-to-wear straps like this Marble Green Alcantara strap that I’m reviewing today. For those of you not familiar with Alcantara, its often referred to as Ultrasuede, and is considered a premium synthetic suede alternative, so its good for those of you who are vegans or vegetarians out there. Here it is pictured with all the accessories it comes with, which is quite decent. While it doesn’t come with a buckle, it does come with a spring removal tool, a semi-rigid plastic lug measuring card, and is all nicely packed in a special Visconti bag. These straps are well presented and are well crafted. The Alcantara is nice stuff, and has a great soft feel to it and is a great alternative to leather. 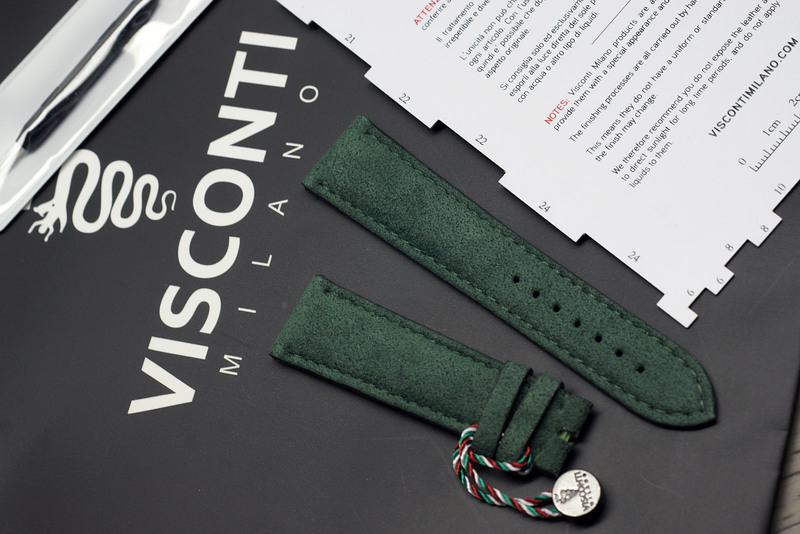 These straps are all handmade in Italy, and with incredible precision. Each one is very well-crafted, with no flaws that I can see. The stitching is straight and even, and the edges finished professionally. Definitely a top-notch product. These straps are premium straps, and certainly feel the part. 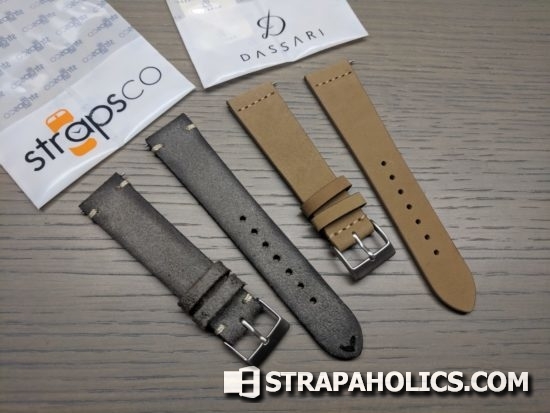 I would be very interested in trying out one of their Panerai straps in the future.. maybe I will review one for Paneraisource.com! These Alcantara straps are backed with rubber, which looks and feels fantastic against the wrist. Its a nicely, professionally finshed material with sizing and logos stamped on the back of it. I actually really like the choice of material for the back of the Alcantara. I’ve seen some alcantara straps backed with leather, which actually doesn’t make sense because it would turn away buyers that want a vegetarian product. 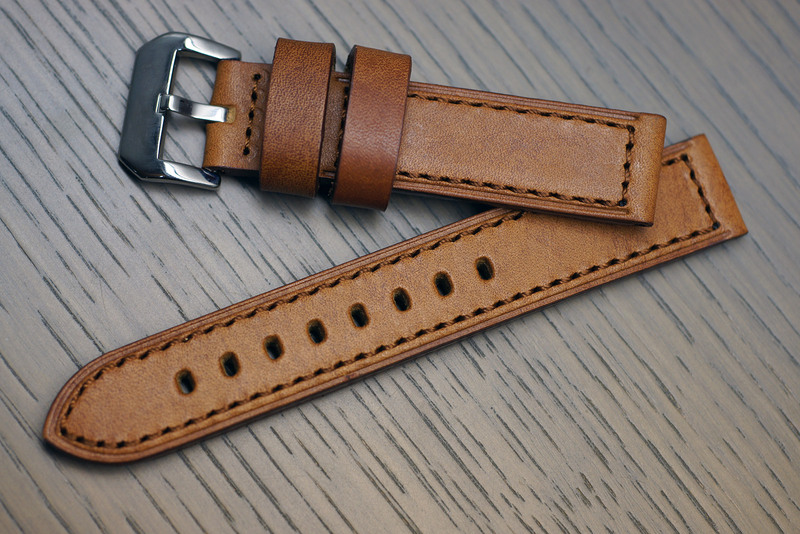 This strap has a 22mm lug, with 18mm buckle width, which is a common size. They call this their Patek style, but it is compatible with most watches that have a 22/18mm strap configuration. The 115/75mm length is pretty standard and should fit most sizes of wrist as well. Here it is in the original packaging that it came in. 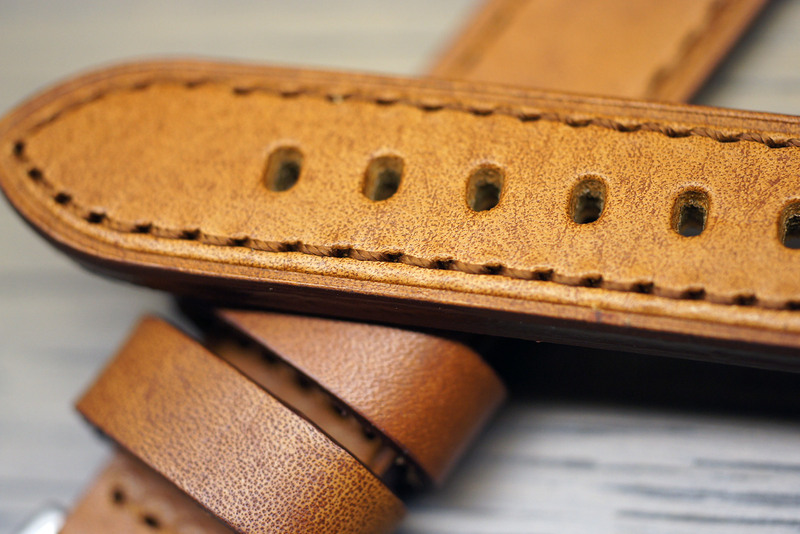 These are definitely premium straps, but they definitely earn their price tag with their premium craftsmanship. 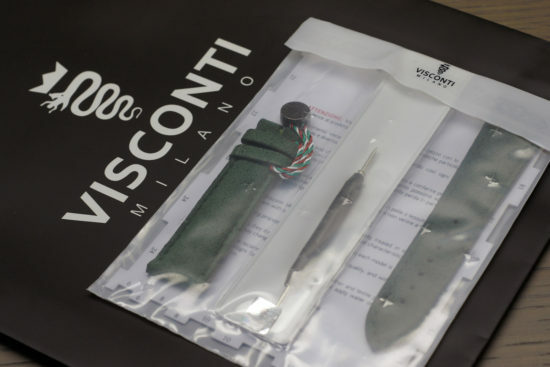 I look forward to experiencing more Visconti straps in the future. Hope you enjoyed the review! Mays-Berlin has been producing some incredible vintage style Panerai straps, faithfully recreating the originals right down to the last details, for the past five years. They’ve been a household name (for strapmakers, at least) in their native Germany as well as many other European countries but now they are growing their following in North America, and we’re lucky to have them! Check out their full review here.